The Department of Music at Barton County Community College provides opportunities for the study and performance of music under the guidance of a qualified and dedicated faculty, as part of an education at an outstanding community college. Our program is designed to develop or increase an understanding of music that may already be familiar and to explore other music that is less known. Any qualified student, regardless of his or her major, may enroll in courses in music theory, composition, and performance. Introductory courses, which have no prerequisites, are offered regularly. Faculty offer private instruction with credit, to students in voice, keyboard and all instruments. 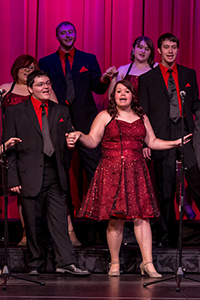 A variety of instrumental and vocal music groups, tours, music classes, solo performance, improvisation and private study are part of the music program at Barton. Our emphasis is on both quality education and quality performance. There are two options available to those majoring in music at Barton. One is selected by students who might not intend to pursue a career in music but who do want to take advantage of our offerings to emphasize the study of music within a humanities setting. The other option provides a foundation for a professional career in music as a performer, composer or teacher. Every student in the major must study music theory and ear training and must participate in performing ensembles. Each student is also encouraged to study performance, and some also study composition. This program is designed to develop the skills and background needed for a career in professional music including the areas of vocal and instrumental performance, arranging, composition, and many others. Upon successful completion of the program, students may choose to complete a Bachelor's degree at a four-year college or university and/or seek employment in a variety of related occupations. To provide a professional course of study to undergraduate students with aptitude and interest in careers in music or music education. Provide learner centered music courses for students in all disciplines to enrich their general educational, avocational and life long learning education. To participate in professional and volunteer service opportunities, which promote the art of music. To contribute to the enrichment of the cultural life of the college's extended community by offering opportunities for intellectual discourse and by presenting musical performances of high quality. Excellent music facilities, including practice rooms, a piano lab, a MIDI lab, a professional concert hall, and the Dorothy Moses Chapel. Regularly scheduled student recitals and concerts. For the student not majoring in music, Barton offers opportunities for ensemble and solo performances as well as performance awards for participation in these ensembles. Barton Community College was recently ranked in the top 50 Community Colleges in the United States. * The Music faculty at Barton work with all Kansas colleges and universities to ensure the rigor of our curriculum. The music curriculum at Barton mirrors the first two years of coursework at four-year colleges and universities. Class enrollments are smaller than those at a four-year college or university. Smaller class sizes equate to more opportunities for individualized attention to help students hone their talent. The tuition, fees and housing expenses are significantly lower at Barton than state or private university expenses. We work closely with students' individual circumstances and develop a personalized track for successful completion of the program based on a timeline that best meets their needs. A variety of instrumental and vocal music groups, tours, music classes, solo performance, improvisation and private study are part of the music program at Barton. Our emphasis is on both education and performing. 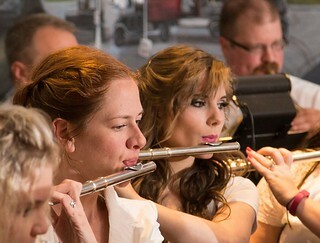 You’ll find excellent opportunities to develop your musical abilities with a dedicated, professional and caring faculty. 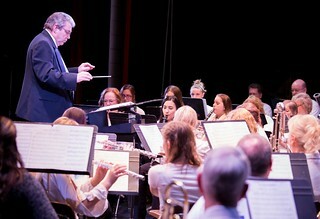 The Department of Music at Barton Community College awards the Associate in Arts degree which readily transfers to any state or private school in Kansas. This program includes the first and second year music courses for music majors, as well as general education requirements for all students. These course offerings have a commitment to giving you the best possible preparation for continued study. Applied lessons are available for you in voice and all instrument and keyboard areas. Scholarships and/or performance awards are available for full time music majors and non-majors participating in performance ensembles.